It is no secret that the aromas exuded by fragrant essential oils have the power to influence moods; some are meant to gently uplift moods while others have calming effects. Craft the perfect aromatherapy candle using one of the recipes below. This sweet, floral fragrance has the ability to calm an anxious mind and soothe a tired body. Laced with a few lavender flowers, this clear gel candle can set the scene for a relaxing evening any time of the year. Cut up the gel into small chunks and put inside the glass or metal container. Heat it over a low flame until all the pieces melt, stirring gently. Check the temperature and maintain it below 230 F at all times. Attach one end of the wick to the bottom of the small glass container using the tab and the other end to a toothpick or chopstick resting across the rim of the vessel. When the gel has melted, remove from heat and add a few drops of liquid color that contrasts with the color of lavender flowers. 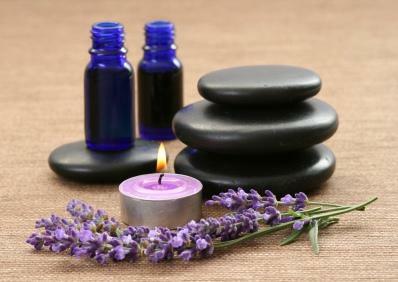 Add 40 drops of the lavender essential oil or 20 drops of fragrance oil. Gently pour in a layer of the gel to avoid bubble formation and allow it to set. Sprinkle 3-4 lavender flowers on the setting layer. Pour more layers, adding a few flowers in between, until the jar is just 3/4 full. Let the gel set for 4-5 hours and then trim the wick to 1/4". Use different colors for different layers. Add one or two complementary fragrances such as pine and basilicum to make an exotic combination. This pure beeswax candle brings you a woody fragrance reminiscent of dark forests and green meadows stretching as far as the horizon. It has a soothing soporific effect that is enhanced by the natural honey notes of the beeswax. Burn it in the bedroom inside a tub of water for a good night's sleep. Break the beeswax into pieces and put inside the double boiler. Keep over medium flame till the wax is completely melted. Prepare the molds by spraying silicone on the inner surface. Dip the wick in melted wax and fix it to the bottom of the mold using the tab. Attach the free end to a pencil that will rest on top of the mold to hold the wick in place while the candle dries. Remove the double boiler from the flame, and stir in 30 drops of sandalwood oil, or 10 drops of fragrance oil. Ten drops of ylang ylang oil can be added too. Pour the wax into the mold until it comes up almost to the edges of the vessel. Rest the pencil over the top of the mold cavity and set it for cooling on a cool metal surface. When the sides have cooled leaving a small area of melted wax in the center, quickly pour out the liquid wax to form a central cavity. Trim the wick to 1/4th of an inch. The central cavity protects the flame of this hurricane candle from drafts so that the candle does not go out easily. Beeswax candles are rather difficult to relight. The natural color of beeswax is elegant, but colors can be added too. Other complementary fragrances to use include cedarwood, vetiver and rosewood. Use 10 drops of each, keeping the total essential oil addition to 40 drops. Citrus scents are fresh, happy, and full of life. Have plenty of these candles around to make any party lively. To anchor the fresh notes, and the bright lively colors, paraffin wax is used. Cut up the paraffin wax into small chunks and put inside the double boiler. Heat it over a low flame until all the pieces melt, taking care to keep the temperature below 200 F.
Pour out 1/3rd of the melted wax into each metal jug and add a different color to each. Add 20 drops each of the three essential oils to each jug and mix. Keep the jugs in a tub of hot water. 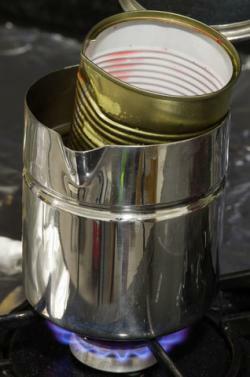 Attach the tab of the wick to the bottom of each small glass/metal container and tie the free end to a toothpick or popsicle stick kept across the container. Pour in a layer of one color and allow it to set. Pour more layers of different colors, allowing the wax to set between the layers, until the container is 3/4 full. Let the candle set overnight, and then trim the wick to 1/4". Unmold the candles by dipping the molds in hot water and gently easing them out. Two-tone candles can be made with just two layers. Pouring in the second layer when the first one is only half set, and mixing the layers with a skewer will give a swirl design. Pine or peppermint oil can be used to enhance the fresh fragrance. This aromatic shrub gives a refreshing essential oil that is warm and spicy, perfect for providing a cozy feeling on cold evenings or rainy days. Add a few drops of Eucalyptus oil to decongest the nostrils or melt away headaches due to sinus congestion. Soy wax is used as a greener alternative. Put the soy wax chips into the double boiler and melt the wax on low flame, maintaining the temperature below 220F. Fix the wick to the bottom of the shot glasses using the tab. Tie the free ends to pieces of broomsticks that rest on the top of the shot glasses. When the wax has melted, add a few color tablets and stir to dissolve. Soy wax takes lesser amount of color as well as fragrance compared to paraffin wax, so add more chips if you like strong colors. Take the vessel off the flame and add 2 tablespoons of patchouli oil. Optionally, add 10 drops of cinnamon oil for a sweet note or 5 drops of eucalyptus oil for a sharper aroma. Gently pour the wax into the shot glasses until it comes up to 3/4th of the height of the glass. Set it for cooling overnight and trim the wick leaving 1/4th of an inch above the candle. Any citrus oil can be used instead of eucalyptus oil. These tiny candles will freshen up the house with its peppy fragrance when used as tea lights. Use them frequently during holiday festivities to keep you and your home full of life and energy. Break beeswax into small pieces and add to paraffin wax granules. 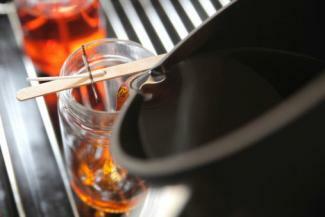 Melt the mixture in a double boiler, ensuring that the wax does not get overheated. Dip the wick in melted wax and fix it to the bottom of the molds with the tab, attaching the free ends to the toothpicks. Remove melted wax from the flame and add 40 drops of peppermint oil or oil blend. Pour the wax into the molds till it comes to the edges, and set them for cooling. Replenish with more melted wax to make up for any shrinkage. Trim the wick to 1/4th of an inch when the candles have cooled. Essential oils of ginger, pine or palmarosa may be blended in with the peppermint oil to add a bit of mystery.